Ruffle Your Style! Ruffles have been seen on numerous fashion runways for Spring / Summer 2018. Designers such as Chanel, Alexander McQueen, and Valentino experimented with frills to add a feminine touch. From frilly flowing dresses, to ruffled off-the-shoulder tops, to ruffled bathing suits – the ruffled look will be ubiquitous this Spring and Summer. Don’t ruffle your feathers by missing out on this look. Browse through our featured ruffled looks so you can incorporate this trend into your Spring and Summer wardrobe. Look, click, shop, and enjoy! 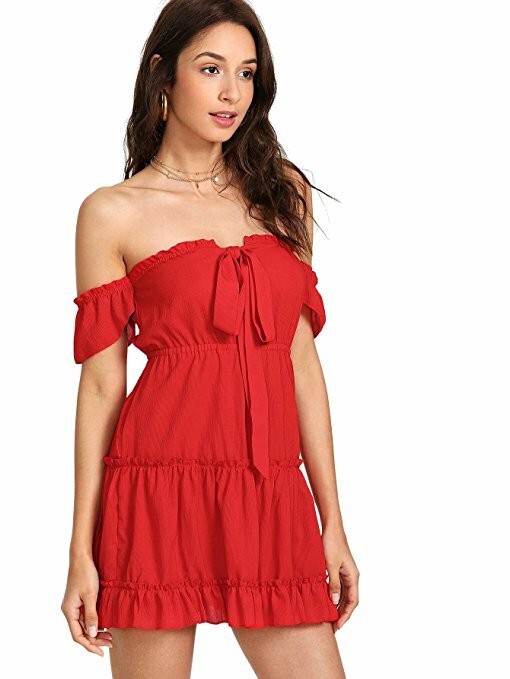 Simplee Apparel Women’s Off Shoulder Ruffle Dress. A Short Sleeve Casual Mini Dress. CLICK IMAGE FOR DETAILS. Calvin Klein Women’s Off Shoulder Ruffle Maxi Dress. 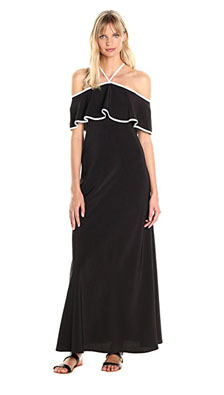 Solid off-the-shoulder ruffle maxi dress with contrasting detail accents. CLICK IMAGE FOR DETAILS. 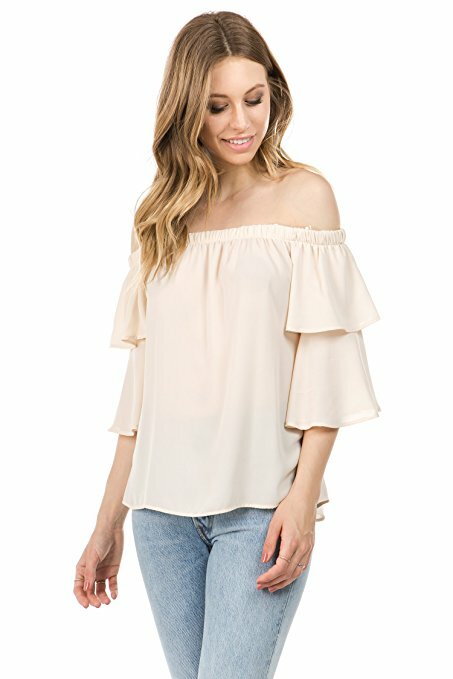 Bubble B Women’s Off Shoulder Ruffle Sleeve Woven Top. CLICK IMAGE FOR DETAILS. BCBG Liliana Tulle Maxi Dress. Multi-dot embroidery on tulle defines this floor-grazing dress infused with a whisper of metallic that features fluid ruffles and floral lace adorning its fitted bodice and billowy skirt. CLICK IMAGE FOR DETAILS. GUESS Women’s Beverly Cold-Shoulder Romper. Cold-shoulder romper elevates your daytime look with an allover floral print and lace trim with ruffled sleeves. CLICK IMAGE FOR DETAILS. 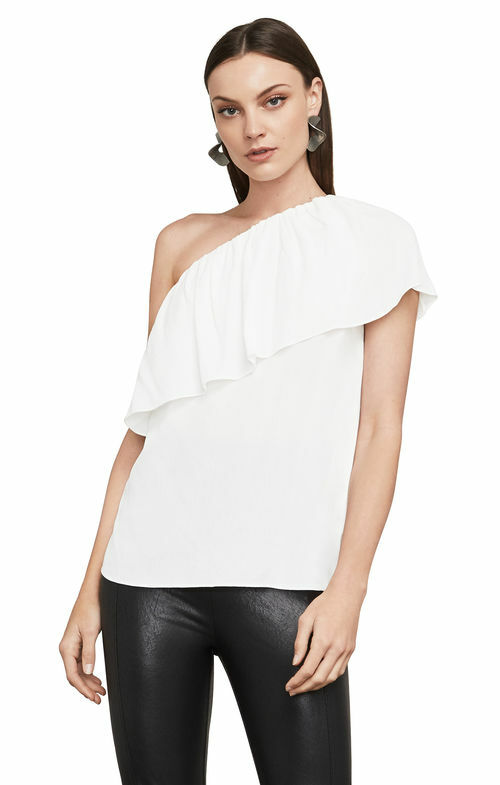 BCBG Max Azria Kamila One-Shoulder Top. A carefree, Bohemian spirit of this single-shoulder creation. Its fluid, ruffled neckband and gentle fabric drape evoke a retro-chic style that looks just as great with denim as it does with dressier pieces. CLICK IMAGE FOR DETAILS. 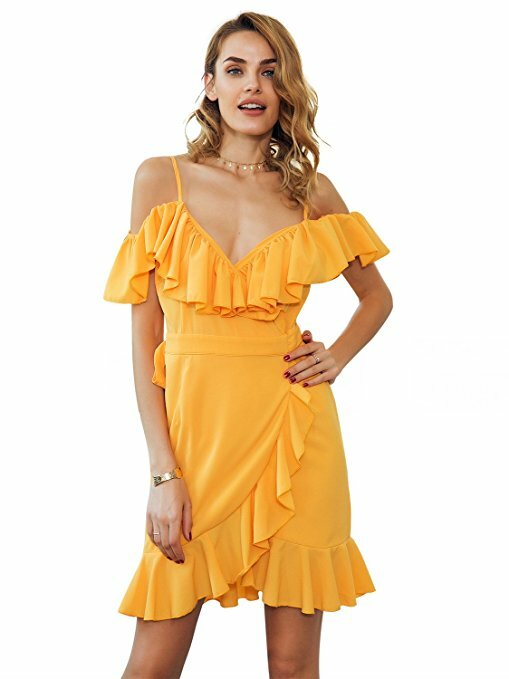 Floerns Women’s Off-The-Shoulder Mini Beach Shift Ruffle Tiered Dress. CLICK IMAGE FOR DETAILS. Are you interested in creating your own personal Fashion Want List using our free women’s fashion iPhone App? For more information on the Fashion Invite App created by Knag Enterprises in conjunction with Fashion and Invites, visit the following post: FASHION INVITE APP FOR IPHONE! HAPPy swiping and hAPPy shopping!